Every child should grow up healthy and ready for school. 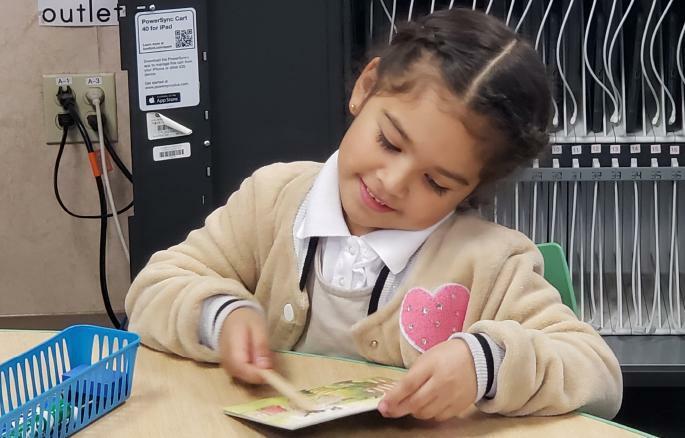 Transitional Kindergarten (TK) gives our youngest students a head start in instruction and provides them with an opportunity to learn and grow in an environment tailored to meet their academic and social needs. TK is offered for free and is the first of a two-year kindergarten experience for children turning 5 years old between September 2, 2019 and December 2, 2019. Child turning 5 between December 3, 2019 and May 31, 2020 qualify for the TK Waitlist. Visiting your local school. Check the School Locator to verify the elementary school attendance area for your address and to ensure TK is offered there. Clicking here for online registration which will open on February 1, 2019 for the 2019-2020 school year. Why TK for Your Child? You want the best for your children. Why not set them up for success from the start? TK is an extra year of schooling for children who are not eligible for kindergarten (children must turn 5 prior to September 1 to enroll in kindergarten). TK ensures our youngest learners build skills and experiences they need to be successful in kindergarten while giving them an opportunity to learn academically through meaningful play. TK helps students improve self-confidence, form better relationships with other children and adults, and achieve greater success in school and life. In fact, students who participate in TK are more likely to graduate from college than those who do not. Students whose fifth birthday lies between December 3 and January 2 in the current school year, will be considered first. Students whose fifth birthday lies between January 3 and January 31 in the current school year will be considered second. Students whose fifth birthday lies between February 1 and May 31 in the current school year will be considered third. Eligible children with a completed enrollment packet may be placed on the TK Waitlist by contacting the Early Learning Department at (408) 283-6039. TK is available at no cost to families. TB Test (PPD): Must be given and read with 18 months prior to entry of kindergarten (after March 2014). A complete record of date given, date read, and results. Proof of Residence: PG&E bill, rental/lease agreement, driver’s license, etc. Physical and Dental Examination: Must be given starting March 2014, and the verification of exam must be signed, stamped, and dated by the doctor or clinic. Guardianship Verification: If your student is not residing with either parent, court documentation or a public notarized verification for guardianship is required. Check the School Locator to verify the elementary school attendance area for your address and to ensure TK is offered there. Visit your local school and have the required documents with you to enroll your child. You may also visit the Student Wellness & Support Services Office located at the District Service Center (645 Wool Creek Drive, San Jose, CA 95112) to enroll your child. Begin enrollment and ask the School Secretary any questions to assist you as you complete the process. All parents want to prepare their children for kindergarten but many run out of ideas. Ready4K! can help! This educational tool provides text messages that include FUN FACTS and EASY TIPS which are scientifically proven to help children do better in school. Each week during the school year, parents receive three text messages about important kindergarten readiness skills. At Franklin-McKinley School District, we believe students deserve a high quality early learning experience from birth. For more information or questions, contact Sandra Mendoza, Early Learning Liaison, at 408-283-6039. Funded by the Packard Foundation, and made possible by partnerships throughout our community, Starting Smart and Strong is our shared, long-term commitment to ensure that every child in San Jose grows up healthy and ready for kindergarten. Transitional Kindergarten (TK) is one example of our Starting Smart and Strong efforts. Other early childhood education and health resources for children ages 0 to 5 are made possible through our partnerships with Educare California at Silicon Valley, Catholic Charities of Santa Clara County, FIRST 5 of Santa Clara County, State Preschools, and Head Start.